Whenever I make custard-base ice cream and have leftover egg whites, I often make financiers - those little French tea cakes made with almond meal, egg whites, and brown butter. We love these little cakes dearly, and I have to say I'm a little amazed it took me this long to make a chocolate version! Sometimes, it feels like it's this little blog's mission to talk about chestnuts and financiers! Those topics come up a lot. Honestly, these humble looking little cakes are one of my favorite things. I urge you to try it and I think you'll see why I'm so crazy about them! Because looks alone don't do them justice. Bake a fresh batch at home and you end up with these warm little cakes that have a crunchy crisp texture on the outside, along the edges, and an incredible hazel-nutty, buttery flavor within. I love the basic almond financiers so much that it's the one I make most often, usually with a spoonful of chestnut cream tucked inside (I can combine two favorite things together!). But I've also swapped out the ground almonds for pistachios, hazelnuts, and cashews to make those variations; plus, I've also made matcha financiers. Clearly, I'm a little financier-crazy! And to further this madness, I went with a chocolate version this time. I think it was long overdue. All I did was add a couple of tablespoons of Dutch-process cocoa to the basic recipe I always use. This simple move yielded these decadently-dark cakes, which have the same familiarly delicious nutty, buttery flavor, just now with a blanket of chocolate encasing the whole thing. To get a little "fancy", you can grab some fresh berries - like I did with raspberries - and top a few on top of the cakes. Add them about midway through baking so they don't sink into the batter. I've mentioned before that I can never quite bake my financiers without a bit of a liquid center; I suspect it's because my batter is chilled. It isn't a problem though. In fact, we love that slightly under-cooked center (it's the best part, tied with the crispy crust) so if you're willing, give it a try and see what I mean. These delicious chocolate financiers will be a part of the regular financier-making and eating rotation in our house going forward! I would make financiers just to smell the amazing aroma that wafts up as the brown butter hits the mixture of egg whites, ground almonds, sugar, and flour, and the batter gets stirred together. This is the recipe that made me love brown butter! I usually make a small batch, using 3 egg whites and making 4 regular muffin size cakes. The yield might seem small but these are packed with flavor. If you use mini muffin tins, they bake up more evenly but as I said, a slightly gooey center is actually extremely delicious. Since I'm hardly without berries in the fridge lately, I experimented by taking a few raspberries and placing them onto one of the financiers midway during baking. This way, they stay on the top of the cake. It was a tasty addition. You could also use another type of fruit. Or if you like the sound of more chocolate on chocolate, adding a few chocolate chips during the last few minutes of baking is another option. I don't know how I managed to resist doing that because if anyone is a fan of more chocolate on top of chocolate, it's me! These are best freshly baked and eaten after it has a moment to cool slightly. The crispy crunchy edges (I've read it described aptly as a eggshell like texture) is not to be missed, with the contrast of the warm buttery center. That said, wrap up leftovers and next day, I like to warm them up in a low oven for a few minutes to freshen them up. Still very tasty that way! Brown the butter: Place butter into a small skillet. Cook over medium heat and bring it to a boil, swirling the pan occasionally. It will sputter and sizzle as it cooks. Continue cooking until butter turns a deep brown. Watch closely since it can turn black in a matter of seconds. Remove pan from the heat and keep it in a warm spot nearby. Mix sugar, grounds almonds, and cocoa together in a large saucepan. Stir in the egg whites and place the pan over low heat. Stirring constantly, warm the mixture until it turns runny and feels hot to the touch, about 2-3 minutes. Remove the pan from the heat. Stir in flour. Then gradually stir in the browned butter until incorporated. Transfer the batter into a bowl and cover it with plastic wrap pressed directly against the surface. Chill for at least 1 hour (or up to 3 days). Preheat oven to 400 degrees. Butter and flour (I find baking spray also works well) 4 cups of a standard size muffin tin. Fill each cup almost all the way to the top with batter. Bake until financiers are golden, have domed, and feels springy to the touch. This takes about 13-15 minutes but bear in mind that baking time will vary if you use a different size mold. Turn the financiers out onto a cooling rack. Let cool slightly. They are best eaten while still slightly warm, with a crunchy crisp exterior. Optional raspberry/fruit topping: If desired, remove muffin tin from the oven about midway through baking and place a few fresh raspberries on top of each financiers. Return the pan to the oven to finish baking. My husband and I love simple little desserts like this. The financiers look perfect for when you want a little bite of something sweet. These little babies pack so much flavor. 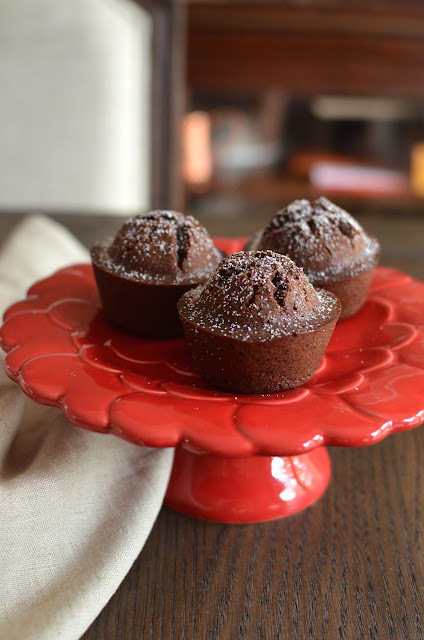 Even baking them in mini muffin tins and having a couple of those would make a nice nibble with afternoon coffee or tea or for dessert. 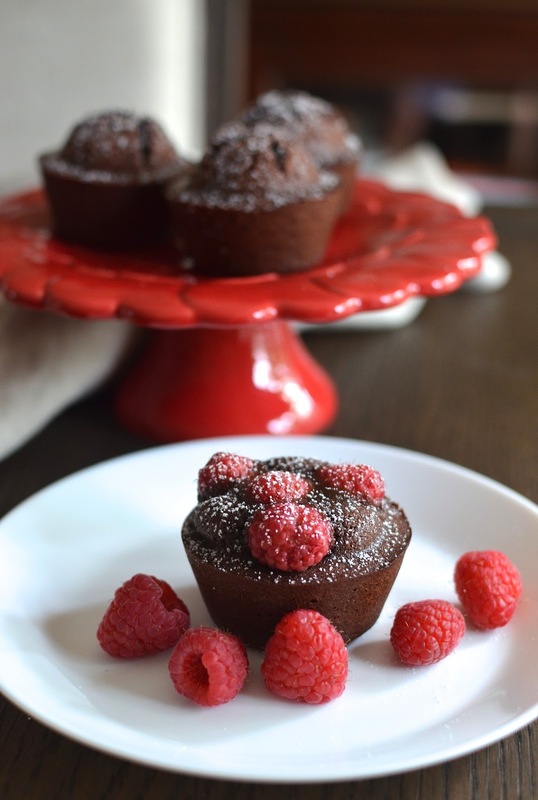 Served with raspberries, these look wonderful! Hi Monica, will have to make this little beauties, I love a little something sweet in the afternoons with tea especially something chocolate or vanilla. Hope you are having a wonderful long week-end with your family. Oh yes, an afternoon break with a little something sweet is so nice. Hope you enjoy Oregon and have a great summer there, Cheri! And you enjoy this Memorial Day weekend, too! My kind of chocolate desserts, Monica. The one with raspberries is so gorgeous. 1 cup almond flour just 50 grams? Thought it was 100 grams. And thank you for this - my bad, it is 50 grams or "1/2" cup of almond flour. I had a feeling I'd mess that up one of these days with my half recipes. Thanks for pointing it out! All fixed now. 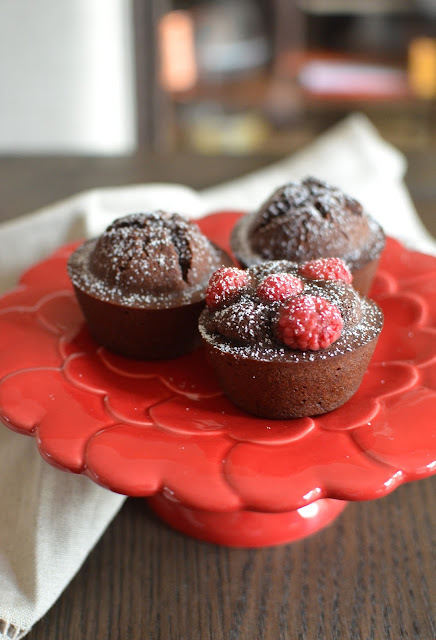 These financiers look so wonderful and I love chocolate and raspberries together! Thanks, Christin...it's a nice combo for sure. Monica this looks DIVINE! Totally loving this financiers. especially that burst of filling near the top! A little burst of color and flavor is nice, I agree. Hope all is well! Thanks, Bal. It got me in a Valentine's Day kind of mood...that red cake plate always does that for me. ; ) Hope you had a good Memorial Day weekend. Thanks - they are simple and so good! The egg whites and ground almonds are key. The "plain" is my first love but these chocolate ones are fantastic. My hubby also really likes the matcha. : ) Hope all is well! These financiers have my name written all over them! haha Monica I always think of you whenever I see almond, chestnut or chocolate baked goodies!! These sound absolutely fantastic! I wish I had one to go with the tea I'm sipping right now!